Prepare the duck by pulling out any loose feathers, quills and remove wing tips and feet if still attached. If your duck still has a complete head, keep it on as it aids coating the duck when lightning the skin. Do not trim or shorten the neck for the same reason. First, dry the duck thoroughly with a paper towel inside and out. 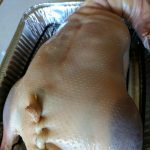 Attempt to separate the skin from breast by sliding fingers between the meat and skin, being careful not to tear the skin. This is the process where commercial chefs would typically inflate the duck using an air compressor. This is not an essential step but separating the skin aids in achieving that super crispy skin. 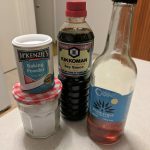 Mix and dissolve equal parts volume (2 tsp each) soy sauce, baking powder, salt and 1/4 cup maltose syrup/honey or agave. 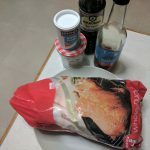 You may need to heat the liquids and add the salt and baking powder to it to dissolve. Once dried and skin separated, rub the skin with the soy sauce syrup ensuring even coating. it will leave a lightly stained skin with a liberal coating of baking powder and salt. This will dry out the skin and aid/increase the Maillard reaction when roasting for that deliciously ruby skin. (optional but preferred) prepare 1 tsp Chinese five spice powder, Hoisin sauce, soy sauce and 1 clove of minced garlic. Take this mixture and rub the interior of the duck, it should be a thick paste coating the inside of the cavity. as shown in my photo you can thread/stitch up the cavity by weaving a bamboo skewer through the skin. This will season the meat internally while roasting and will not stain or impact the skin colour. 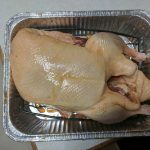 At this point and when the skin is clearly dry, the duck can again be rested for another 12 – 24 hours to continue dehydrating the skin or immediately roasted. There are two ways you can roast the duck. Traditional Beijing ducks are roasted over wood fires (much like a stone bakers or pizza oven). To get similar results you can slow smoke the duck and then blast it in a hot oven to crisp the skin. Alternately you can roast the bird directly in the oven which unfortunately will lack the smokiness of traditional roast duck but still yield beautifully rendered and crisp skin. Preheat the oven to 200deg c and roast the bird for 1 hour, rotating every 20 mins then reduce the temperature to 120 deg c and continue to roast until the duck is fully rendered and internal temp is 60-65 deg (med-well). 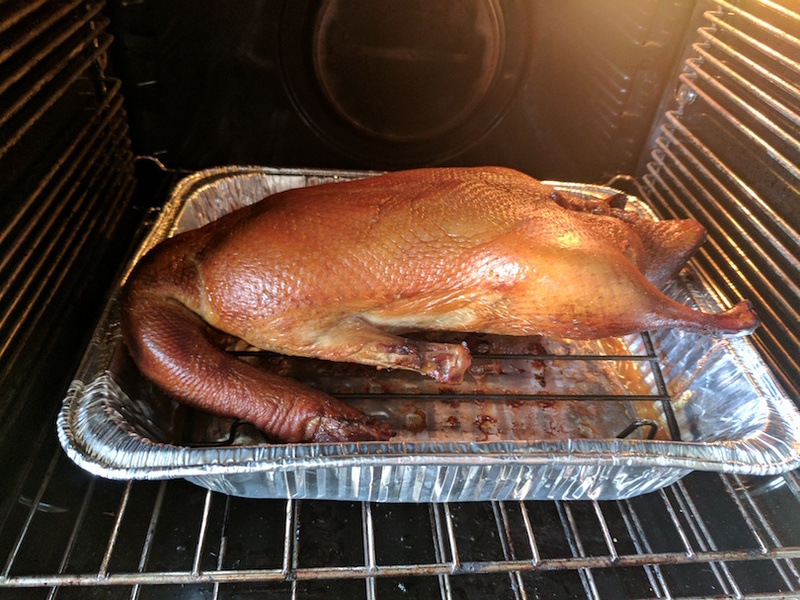 If the bird is darkening unevenly, feel free to flip and rotate the duck as often as possible, just be sure to remove the duck when you hit the target internal temperature. 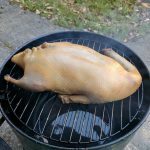 Setup for smoking in an offset or drum smoker with coals/wood and set the smoker for 120deg c. Add the duck to the smoker and hot smoke for 1-1.5 hours depending on the size. Check every 30 mins for an internal temp of 55-60 deg c in the thickest part of the leg. It will rise by 2-5 deg on resting and then to well-done post oven roasting. When ready to remove from the smoker, set your oven to the highest temperature possible (usually 250 deg c). Pre-heat a roasting pan with a cake/roasting rack for at least 30 mins. This period will allow the duck to drop in temp somewhat between smoking and roasting and avoid overcooking during the blast/crisping phase. Once the oven is preheated, add the duck to the oven and rotate the duck every 7 mins to ensure even colour on the skin and render of fat. This process usually takes between 25-30 mins to get full even colour and rendered well. Keep your eye on it, once fully roasted (a deep Peking duck colour) you can remove the duck from the oven and rest for at least 25-45 minutes before carving. This resting process will ensure the duck is as succulent as possible. Carve exactly like chicken into 8 pieces. Breasts and legs can be chopped with a cleaver Chinese style if preferred. Enjoy!